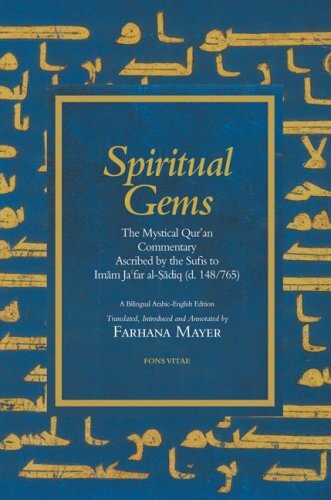 Spiritual Gems: The Mystical Qur'an Commentary Ascribed by the Sufis to Imam Ja'far al-Sadiq (d. 148/765) (The Fons Vitae Qur'anic Commentary Series) est le grand livre que vous voulez. Ce beau livre est créé par Ja'far al-Sadiq. En fait, le livre a 189 pages. The Spiritual Gems: The Mystical Qur'an Commentary Ascribed by the Sufis to Imam Ja'far al-Sadiq (d. 148/765) (The Fons Vitae Qur'anic Commentary Series) est libéré par la fabrication de Fons Vitae. Vous pouvez consulter en ligne avec Spiritual Gems: The Mystical Qur'an Commentary Ascribed by the Sufis to Imam Ja'far al-Sadiq (d. 148/765) (The Fons Vitae Qur'anic Commentary Series) étape facile. Toutefois, si vous désirez garder pour ordinateur portable, vous pouvez Spiritual Gems: The Mystical Qur'an Commentary Ascribed by the Sufis to Imam Ja'far al-Sadiq (d. 148/765) (The Fons Vitae Qur'anic Commentary Series) sauver maintenant. The Arabic follows the text of Paul Nwyia's edition, including the lack of markings on the Arabic text of the Qur'an, per the request of the translator. Paul Nwyia came from a generation of scholars who subscribed to the notion that all the text in a manuscript, including Qur'anic passages, should match the manuscript text exactly. The majority of modern scholars in the field, however, no longer hold this view; rather, they believe that tafsir scholars would not have objected to the later addition of diacritical marks to the Qur'anic text as necessary, and in fact, would have expected this to be done. This is because they did not consider the Qur'anic passages as part of their own work; these passages could then be altered according to the received text of the Qur'an. The evidence for this view can be found in a number of texts on manuscript editing.